The Covert Flannel was designed from the very beginning to protect from abrasion and impact. The entire shirt has been lined with genuine DuPont™ Kevlar®, not just a small patch at the elbows. Additionally all the critical seams have our unique Exo-Stitch® to keep this shirt together if you hit the ground. If you want extra protection from impacts, there are pockets for optional SAS-TEC® CE armor at the elbows, shoulders and back. We tried the size Medium in this jacket on Huey and we put an XL jacket on Dewey. These are the sizes they normally wear and both fit very well. Finding a fit in this style won’t be difficult. The overall style is simple and the shirt is fairly relaxed in fit. I’d advise you choose the size you normally wear in men’s clothing. If you are between sizes, I’d advise to go up, particularly if you plan on adding armor. You can also use the chart below to choose a size based upon your chest and/or belly/waist measurements. This shirt is cut like… um, a shirt so it doesn’t taper at all from chest to waist like jackets do, but even so, if you have a bit of a belly it wouldn’t hurt to put a tape around it and make sure you are OK with the size you’ve chosen. Most people will be able to add back, shoulder and elbow armor without going up in size, but if you plan on adding a back pad, please add 1” to your chest measurement to compensate for the thickness of the added back pad. Need help measuring? Get it here we’re done. 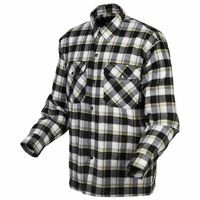 The Covert Moto Flannel Shirt is a step above other “moto shirts” we’ve sold in the past. It has provisions for added are and convenience features you find on traditional riding jackets. Its more than just a flannel shirt! Have a look at the video on this page… it gives a good look at the details about how this shirt is reinforced to improve its abrasion protection beyond what a normal shirt would provide (which would be near zero). The addition of the Kevlar layer and the moto-specific stitching is a good thing to hear. The overall effect is very sharp. The weight is “medium” even with the Kevlar layer added so I think the comfort will be there for average weather use. We’ve been selling the SAS-TEC brand armor inserts for years and this shirt includes pockets for the addition of those armor pieces. This armor is very robust is a good product for a light weight shell like this it. It is flexible, but will absorb impact well. See the link below to buy the pieces you want. There are a few nice touches I think makes this shirt better than others I’ve seen; it has a standard shirt collar but the tips have little snaps to hold them down so they don’t slap your neck when riding, I also see that the plackets at the sleeve ends have concealed Velcro closures so the wind doesn’t shoot up your sleeve; note the zipper behind the row of snaps in front. That will keep this shirt on your body in case of a fall, but being concealed, it doesn’t take away from the flannel shirt look. Inside, there is a zip close pocket. Scorpion says “concealed carry pocket” but its kind of small for that so I’m skeptical you’d find this shirt capable of carrying a handgun…. the shirt is just not sturdy enough for the weight. Anyway, its a well placed pocket for some valuables or your technology. 3D-Protector from visco elastic soft foam with outstanding shock absorption values: Residual force < 13 kN (Norm, level 2: 20 kN).